I hope that you have enjoyed this walkthrough, and I hope it helps you get past stupid IP bans on the site of your choice. Have fun, and happy hacking! Remember: Don't do anything illegal or stupid with the AOL proxy...Just because it is not showing your IP doesn't mean the Feds can't find you. Everything is stored on an AOL Database....Just a heads up...If you liked this article, then please become a follower of this blog. Thank you. I have problem, is it possible to help me? i have installed AOL 9.6 on my PC but it's Topspeed is off and I cannot use it as my proxy. Hi Ali did you follow the directions and create a new connection profile? Make sure you set up the new profile to use "Home Network" connection instead of broadband. After you have created this profile, sign on broadband with your aol name once, then sign off. Now you can sign on with your new connection profile, and have access to the aol proxy. I hope this helps. in our company we can access internet only via the company's vpn. my aol 9.6 can connect to the internet but can not open filtered websites or surf anonymously. but when tested it in no vpn networks it worked pretty good. is there any solution for vpn nets? Corporate VPNs can be tricky. It all depends on how the VPN is setup. It could be that they blocked certain IPs or that they have some other type of filter rule. Another thing it depends on is what you are trying to access that you can't. If you could reply with what your trying to access that is blocked, I might be able to figure out how to help you. it is a simple pptp vpn for internal use of our company that let some of us access to regular internet in additional of our intranet. aol makes no difference in my ip and connection and even can not open aol download or aol experience(my welcome page).but when i try without vpn on the same isp (out of the company) every things are excellent. i installed Forum Proxy Leecher but unfortunately in every try it got 0 proxy also i tried some proxies from various servers and also they didn't help me . A lot of those proxy source links are dead, plus im sure your vpn blocks access to those sites. Its best to compile a list of proxies while you are not on the VPN and then check them using the "Bleach" utility that comes with forum proxy leecher. Test the proxies while you are on the vpn. these days i found an checked several proxies with no benefits and the problem still remains . I'm in favour of changing DNS . what do you think about this? Well im afraid changing your DNS might not help you with your problem. It only will change the server in which your connection resolves host names to ip addresses. This will not change the way your connection connects to different servers. Just the way it resolves them. I'm sorry I couldn't help you more, but I do have one more thing you can try. Have you tried PHProxies, or CGIProxies? If you can find one that works, you might be able to gain access to pages, however if they have embedded flash programs, like YouTube, they may not play because flash isn't using the PHProxy or CGIproxy. I hope that helps you somewhat. If you want a list of PHP Proxies, then check out this link... http://www.freeproxysite.com/ it has a great list to choose from. See if any allow you to get in. 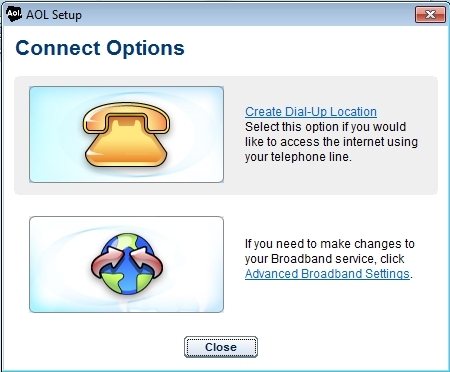 AOL 9X no longer supports "Home Network" connections. Does anyone have a way around this? Or does this spell the end of external usage of the AOL proxy? I just used aol 9.5 as I described in my article and it still works. You must first sign on with a broadband connection, sign off, and then use your home network connection that you have set up. If you follow my directions exactly then it will work. 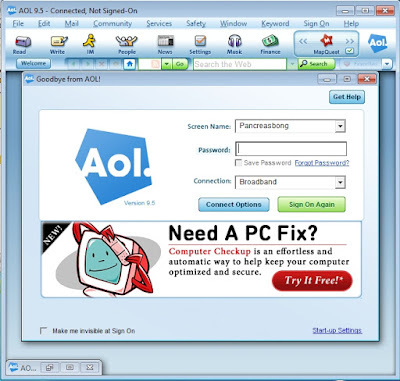 There will never be an end to the aol proxy. Its the foundation on how aol works. It has been working for more than 15 years. funny thing is its already disabled and I have unchecked the box saying "Use a proxy server for your LAN"
Thanks. Worked like a charm today. how do u do ? few mounts ago the AOL has been stopped working In Iran and I thinks It has been filtered by Iranian Government. Is there any solution to reactive Aol? I create a new connection profile but It didn't work . Ray, jeezuz! Thank you my god, this saves me SO much cash in peas! hello friend pls i need you to help me how will i connect with aol but am using black berry plan to connect. how about AOL 9.0? I go into the chat rooms and there are people who do something I think called dosing? so they send like a 1000 ims and it does something to my signal. Any advice to block this? Ray, i do need your help. So ive been using this technique with my old laptop, and its work for many years. Where should i do that? And i cant even sign in using the new add broadband profile as your way. Really wait for your help here, thank you so much..
Im using Windows 7, Norton Internet Security version 20.5 and already allow all the firewall settings for aol. Hello...Thanks for reading my blog. I have noticed that this technique does not work for windows 7 and windows 8 64 bit. I am not sure what is causing the hiccup and I don't think AOL will be fixing it any time soon as it is not on the top of their priorities. Your best bet if you want this technique to work in Windows 7 64 bit, or Windows 8, you need to look into virtualization. It doesn't matter what software you use to do it, Virtual Box, Hyper-V, VMWare, or even Parallels for Mac. If you do end up setting up a virtual pc inside your pc to run AOL make sure you play it safe and get a 32 bit version of Windows. It will work in your virtualized environment in this way. 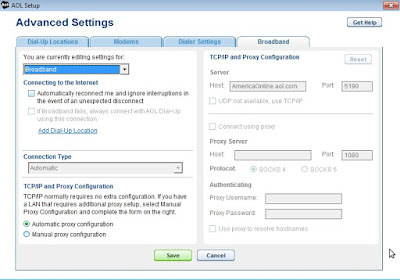 By the way you set your browser to use AOL proxy after you have logged into the AOL Home Network broadband profile. If it does not work at first sign on, then sign on the default Broadband profile first 1 time, then sign off and back on to your newly created 'Home Network' connection profile. Please note, you cannot use the AOL proxy without being on the AOL 'Home Network' it will not work in any other scenario. Hi, I used AOL Home Network proxy for years on my computer using the method above. However, as of a few days ago I can no longer sign in using Home Network. I can still connect using a regular Broadband connection, so it's not that. I tried everything I could think of -- turning off my Firewall, shutting off and restarting the computer, etc. -- but I still can't use the Home Network proxy. As I said, it worked fine on this computer until a few days ago. This is really frustrating as it was by far my favorite proxy. Any ideas on what might be causing this? so if i use a Vm to change ip will it also change the one in the Host? ?